Once you have decided that you would like a bean to cup coffee machine in your office, café, restaurant or hotel you need to decide what coffee bean is the most appropriate. Kenco offer a range of beans to suit most tastes. The Kenco roast & ground range has been developed using 100% Arabica beans. They use only Arabica beans because their aromatic and distinctive characteristics guarantee a superior taste for Kenco roast & ground coffee. All the beans for the roast & ground range of Kenco Westminster Medium Roast, Kenco Sustainable Development Medium Dark Roast and Kenco Italia Dark Roast are sourced from Rainforest Alliance Certified™ farms. To earn the Rainforest Alliance Certified™ seal, farms must eliminate the use of the most dangerous pesticides, and reduce water pollution and soil erosion. These farms can contribute to local conservation initiatives through restoring wildlife habitat and preventing deforestation. It is on these farms that Kenco’s Arabica coffee cherries are carefully grown and then harvested once they are fully mature. On Rainforest Alliance Certified™ farms, workers and their families are treated with respect and have access to clean water, medical care and education for their children. Rainforest Alliance certification also helps to ensure a decent wage for workers. The Kenco Westminster is a medium roast bean. 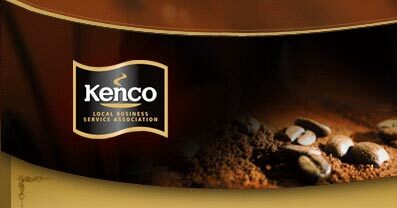 It is a classic blend of 100% Arabica beans, Kenco Westminster is distinctively smooth and has a well rounded flavour. Kenco Westminster is the perfect blend for a simple black or white coffee. Specially selected and blended, Kenco Westminster beans deliver the perfect cup of coffee for you to enjoy at any time of day. This coffee is also available as a filter coffee for filter and bulk brew machines. This is a medium to dark roast coffee bean. 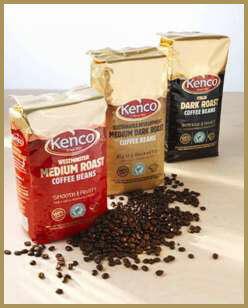 As with the other Kenco beans this is produced from 100% Rainforest Alliance certified coffee beans. It has a rich taste and will produce a cappuccino or latte that will appeal to most people. The Kenco Sustainable Development coffee bean is our best selling whole coffee bean. This coffee is also available as a filter coffee for filter and bulk brew machines. Kenco Italia is a dark roasted bean again produced from 100% Arabica beans. They are darkly roasted to deliver an unmistakably rich flavour and intense aroma. 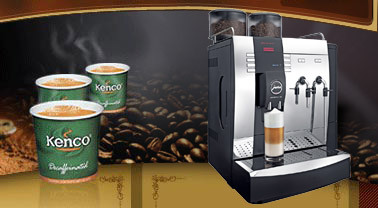 Kenco Italia is ideal for a straight espresso or a cappuccino with a bit of bite. This coffee bean offers even the most discerning coffee connoisseur the opportunity to savour an authentic Italian-style coffee experience. If you would like some advice on what bean is most suitable for you then please call the office and we will be delighted to offer you the benefit of our combined experience. Once you have decided on the right coffee bean for you our technicians have the knowledge and ability to set up your bean to cup coffee machine in the correct way in order to get the most out of your coffee.